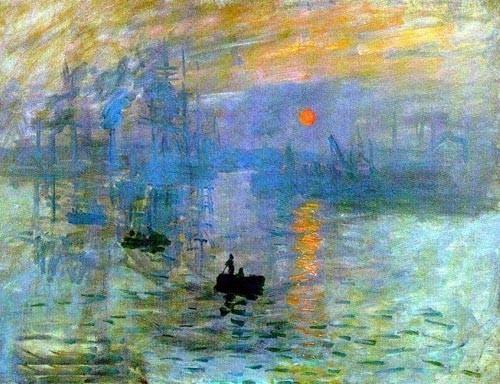 As the world celebrates the life and art of French Impressionist painter Claude Monet, Cheapoilpainting.com marks the painter’s 171st birthday with a special list of his top three paintings. Claude Monet’s artwork is consistently among our highest selling paintings, regardless of seasons, contemporary trends or any other influencing factors. Monet was born Oscar-Claude Monet on November 14, 1840, in Paris, France, the second son of Claude Adolphe Monet and Louise Justine Aubrée Monet. He was a key figure in the Impressionist art movement, which advocated a revolutionary approach that aimed to capture on canvas the process of perceiving nature, particularly the interplay between subject and light. Cheapoilpainting.com Marketing Vice President Olivia Preston said the artist’s importance and impact was reflected in the unwavering popularity of Monet oil paintings. “Claude Monet’s artwork is consistently among our highest selling paintings, regardless of seasons, contemporary trends or any other influencing factors,” she said. To help observe Claude Monet’s birthday, CheapOilPainting.com has compiled a list of the website’s most popular Monet paintings. 1. Impression, Sunrise, or Impression, soleil levant, 1872. This painting is immortalised in history as the literal source of the term Impressionism. It depicts the harbour of Le Havre, France, during a sunrise shrouded in mist. The painting was first displayed at the inaugural Impressionist exhibition of 1874. After viewing the show, newspaper critic Louis Leroy titled his unflattering review “The Exhibition of the Impressionists”, claiming he was inspired by the painting’s name. The renegade painters embraced the label, turning a source of criticism into enough motivation and strength to fuel a world-changing movement. 2. The Bridge at Argenteuil, 1874. 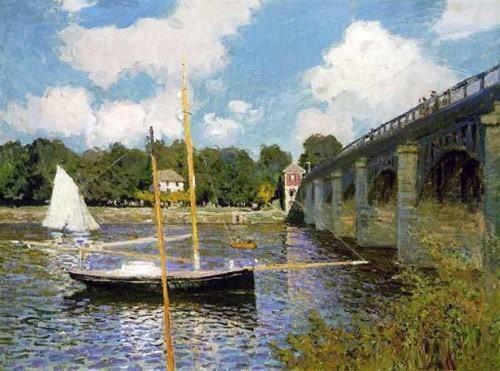 This popular Monet painting, also known as The Highway Bridge at Argenteuil, represents the artist at the height of his powers. Each daub of paint is distinct, yet paradoxically all colours blend together to create a brilliant mosaic of Impressionist fervour. Monet’s technique recreates the lapping water of the Seine River, while the trees rustle in a gentle breeze with the boats basking in the sky’s reflected glory. Critics consider it an exemplary artwork of painting in plain air. 3. 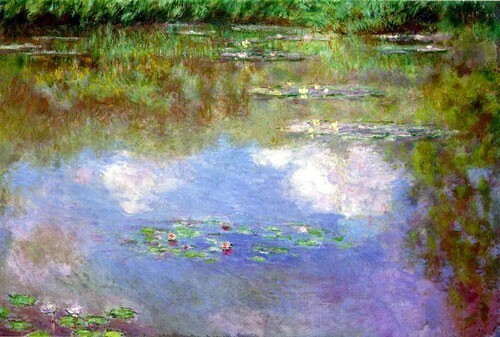 Water Lilies, The Clouds, 1903. A central theme in Monet’s many water lily paintings is the creation of an endless body of water without a bank or horizon in sight, providing the viewer with an image nearly abstract in quality. This unique perspective can be clearly seen in this painting; the sky itself is not visible, rather only a reflection of it. The work is also considered a highlight of Monet’s oeuvre due to its focus on reflected images: trees that line the Giverny pond are slightly visible at the top of the canvas, but mainly appear refracted in the water, companions to the sky and clouds. Monet dots the canvas with lilies to remind the viewer that the painting is a rendition of the world in reflection, with vibrant and colourful hues providing a peaceful platform for quiet contemplation. During his final years from 1910 to 1926, Monet devoted most of his time to painting his water lily pond in the garden of his estate at Giverny. His final series, and arguably his most famous, showed the pond in a series of abstract images where water and plants are depicted in broad and intricate swathes of colour, creating a depth of visual richness and texture. The French government bought the paintings after his death, where they now remain on display at the Orangerie in Paris. Cheapoilpainting.com offers museum-quality famous oil painting reproduction artwork at a price everyone can afford, with up to 70% off gallery prices. The company has a 30-day, 100% money back guarantee, along with an extensive 100% satisfaction guarantee. High resolution photos are sent to customers for approval before shipping any painting and shipping of paintings is free of charge. Browse Cheapoilpainting.com to view its extensive collection of oil paintings and for special offers.